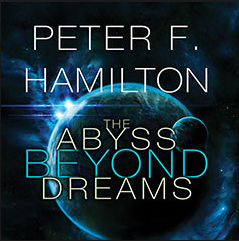 THE ABYSS BEYOND DREAMS by Peter F. Hamilton, narrated by John Lee, is the latest scifi/space opera installation Hamilton’s ongoing Commonwealth series. ABYSS shares the same universe as Hamilton’s other Commonwealth novels and there is some back story and lore that you may or may not be aware of depending on if you have dipped your toe in his books before. Regardless I think you could easily jump into ABYSS and enjoy it all the same. We got to see some old friends although my personal favorite, Paula Myo, is only on screen for a heartbeat. Set before the events in his Void Trilogy ABYSS brings us back inside the mysterious void in the center of the galaxy and takes place in the distant 34th century. The initial events in ABYSS opens to us outside the void and are a wrapper for the primary story which progresses once we arrive inside the void. In ABYSS we are on the planet Bienvenido rather than Makkathran which we knew from The Void trilogy. Most modern technologies and electronics do not function inside the void leaving us with a world seemingly around Victorian England levels of technology with a touch of the old west. Luckily for the people of Bienvenido they have telekinesis and a level of telepathy to help them along. The story begins with the alien Species which guards the perimeter of the void, the Raiel, appealing to Nigel Sheldon to venture into the void in order to destroy it before it can grow and engulf more of the galaxy. Nigel agrees, clones himself, and sends the clone in. Once inside we are introduced to Slvasta who is a member of Bienvenido’s regimental army charged with the defense of the planet from the Fallers, an alien threat which besets the planet by dropping eggs on the world and when a person is lured into contact is essentially body snatched and becomes a Faller. We follow Slvasta in his campaign against the Fallers and eventually meet up with Nigel in his quest to figure out what is going on inside the void and ultimately to attempt to fulfill the mission tasked by the Raiel. We mostly tag along with Slvasta for the bulk of the novel. Slvasta’s squad, early in the story, had a less than optimal encounter with a Faller force which sets him on his path for vengeance and to cleanse the world of the Faller threat. It must be said that it comes to a point where his single mindedness is offputting. There is however some plot devices Hamilton uses that could indicate that some of this may not be the characters fault but I was never sure. Another protagonist we get inside the void is Kysandra. Kysandra is a young farm girl about to be forced to marry the local town mob boss’s fat son in order to pay off her widowed mother’s debts and provide a secure future for them both. At this point all I will say is Kysandra becomes very interesting and I just want to say I enjoyed her growth and arc very much. I also liked Nigel in ABYSS although he was pretty much always in control and was never under threat or real conflict. I would have liked him to have some sort of foil at any point but perhaps that will come in THE NIGHT WITHOUT STARS. On the subject of John Lee, I am a huge fan. He is absolutely unique in narration here in ABYSS is fantastic. I could go on and on about his cadence and precision in his work. I can’t think of anything I’ve listened to with him at the helm that was not enjoyed. I recall there was an uproar when he sat in for Roy Dotrice for the original A FEAST FOR CROWS audiobook. Frankly, while Dotrice is a master craftsman in his own right, I liked Lee’s work best. I’m a big fan of Hamilton’s work and was very happy to get to visit again in the commonwealth and a peek once again inside the void. Hamiltons worldbuilding is so very dense yet it does not hinder the story and he parcels out the tidbits of how life works inside the void and out as well just so as to keep things moving. The technology is fascinating as well which very much helps my immersion in the world. I’m super pumped for THE NIGHT WITHOUT STARS to see how things continue to play out. And here’s to hoping for some more Paula Myo or maybe even a visit from THE CAT.